Safety tips for drivers are just as important as other back to school safety tips. During the back to school season, there are many hidden dangers that affect us all. These are things we may not think about, but should for the safety of our kids. Drivers, in particular, face a few extra considerations where safety is concerned. Here are some safety tips for drivers to consider during the back to school season. When kids head back to school, early morning driving through neighborhoods starts to get a bit more difficult. You have to slow down and consider the larger number of kids heading to bus stops and walking to school. This is most prevalent in the residential neighborhoods around town so pay particular attention and slow down in these areas. During the back to school season, school zone speed limits are enforced very strictly and they should be. The last thing we need is fast drivers flying through areas where there are tons of kids crossing the road. Be very careful of these areas around schools and keep your eyes and ears open to unexpected movements. Kids tend to run out first and accidents can still happen even at these slow speeds. When you leave home for work or school in the mornings, you should automatically assume a longer commute during the school year. This is particularly true during the back to school time of year because some people are new to various schools. This will slow down traffic plus all of the school buses on the road will as well. Allow at least an extra half hour so that you are not rushing around and make bad driving decisions. When you are riding behind a school bus, it is easy to want to zoom on by or get past. They move slow and we are usually trying to move quickly because we are running behind. That said, the kids on those school buses are far more important and we should only pass when there is a very clear opening to do so safely. Make sure you watch out for the bus stops and the lights coming on every so often. Running these lights or stop signs can cost you a small fortune, but more importantly, can cause a horrible disaster. Never be in too much of a hurry to get past a school bus. These back to school safety tips for drivers will not prevent all the accidents, but it will certainly minimize your chances. Keeping our kids and students safe is the top priority for us all and we have to consider that when they head back to school. Foot traffic and car traffic will increase and that means we should increase our awareness to meet the need. 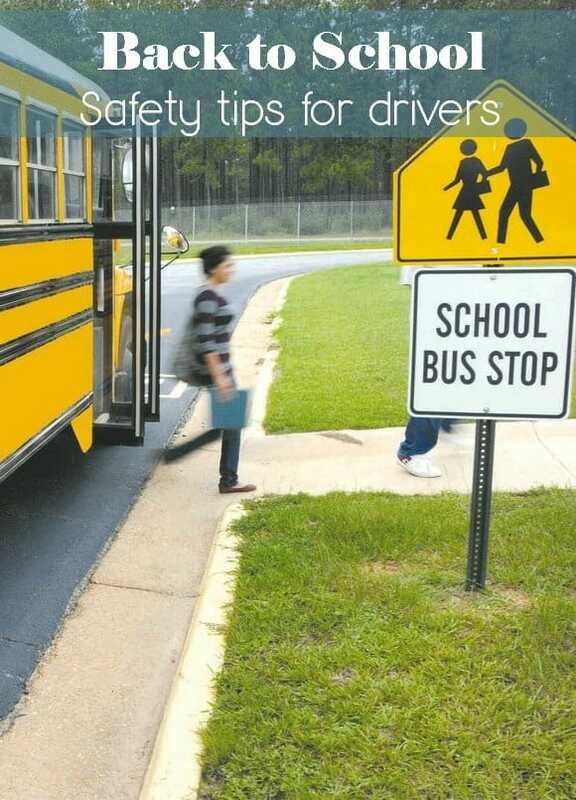 Do you know of any back to school safety tips for drivers that we missed? Share in the comments! If everyone is more mindful, especially at the start of the year, tragedy can be avoided. My daughter is developmentally disabled so I am very afraid of her being around traffic without me. Great tips! This scares me soo much with the start of the school year. These are always great reminders. It gets easy to get distracted and this is definitely not the time of year to be unfocused. Watch out for the little ones! This post is so important. My son started driving only a few months ago. I get so nervous with him. Safety is very important. I’m glad you put the school bus safety. I hate when cars go around the busses. When they stop it means a child is highly likely crossing a street. And stay off your phone when driving! It’s especially important when in and around school zones. I think with kids around, it’s important to be extra careful. Observe traffic rules and speed zones to avoid accidents. These are some really great tips!! We can never be too safe when it comes to our little ones! Great tips! Back to school is so busy around here with people going and coming. Kids getting on buses, walking, or getting dropped off. Definitely will keep these tips in mind. These are very good tips! I’ve seen how many accidents our bus drivers seems to be in and we really need to ensure much better safety here. Awesome tips, Its always great to over the safety rules with your children as school is getting ready to begin. Great tips. School zone safety is soooo important. I’ve seen so many people speeding through school zones. Just imagining what could happen to those little ones breaks my heart. These are great tips! I get so upset when people don’t slow down in school zones but I think some people just forget that it’s not summer anymore! Thanks for the reminder! This is a really good reminder. When school starts back up I’m going to have to make sure I’m adjusting to the new speed limits. Thjank you for these ips. We live 5 minutes away from school so we walk (rain or shine). Sometimes drivers are not mindmul. These tips are so important. We have so many youngsters in our neighborhood and the cars need to slow down. These are awesome tips. The safety of our kids is our utmost concerns. Great ideas! I think giving yourself extra time is the most important. That way you have time to focus and slow down. We struggled with bus stop safety last year. It’s a very busy road where we wait and drivers are constantly driving through the red lights. We stay very alert and have even contacted our local PD to address the issue. Really, it comes down to drivers paying attention. It is quickly approaching. Safety for kids is the top priority. Thanks for this timely reminder!